These tools go a long way in helping you understand the online behaviour of your users so that you can optimize your online presence. Web analytics, the process of tracking the online behaviour of web visitors is the ideal way of predicting the future actions of your online visitors. If you are running a commercial website, it is imperative for you to analyse your web statistics to know the behaviour and buying habits of your customers. However, you should keep in mind that web analytics is not limited to mere compilation and analysis of your data or your competitors’ data; what matters the most is how you utilise the accumulated data. Once you have gathered adequate data, you need to convert the data into actions for improving your site and meeting your business objectives such as— enhancing customer engagement, retaining customers, attracting new customers, boosting sales, and so on. Moreover, by tracking the online behaviour of users, you can find out your best traffic sources, the type of content web visitors like to read, the links that they follow, and the web pages that get the maximum clicks. Analyses of these factors also help you comprehend which areas of your website need work so that you can improve your website accordingly. Nevertheless, sifting through all the data generated by your website can be quite an intimidating process; however, by picking the right tracking tool, you can easily analyse the behaviour of your web visitors in your site. 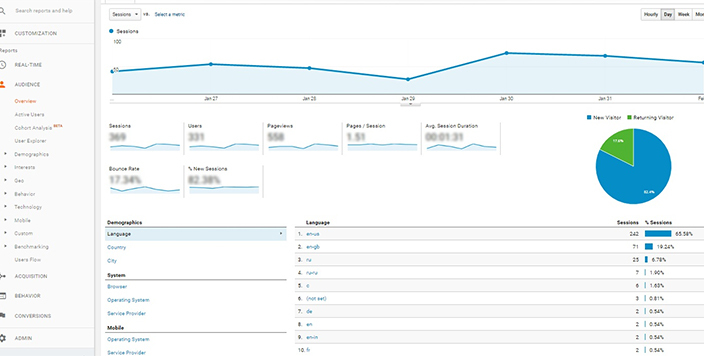 Here are four useful analytics tools that you can utilize to analyse the activities of your web visitors on your site. Google Analytics: This free analytics tool known for its robustness is used by 57 percent of the 10,000 most popular websites worldwide. If you own an e-commerce site, this tool is highly recommended for you as it provides you with valuable data pertaining to user behaviour besides tracking your transaction data and determining the specific pages on your site that drive maximum sales. Google Analytics also gives you an idea about the demographics of users visiting your website including the device that they are using. Clicky: This website traffic analytics tool is an ideal option for those who are seeking more exhaustive information about their online visitors. Clicky is a real-time traffic analysis tool and also easy to install and use. It features a simple dashboard that instantly exhibits your latest statistics such as the number of users visiting your site, the pages they are viewing, time spent by them on your site, and the sources they are coming from. Clicky comes with a unique ‘Spy’ feature that allows you to view the visitors on your website so that you can keep an eye on the trends, as and when they occur. This analytics tool has both free and paid plans. GoSquared: This is yet another effective tool designed for websites and apps to track the online behaviour of users. This platform has a sleek interface and is easy to navigate. What’s more, it is available in both paid and free versions. 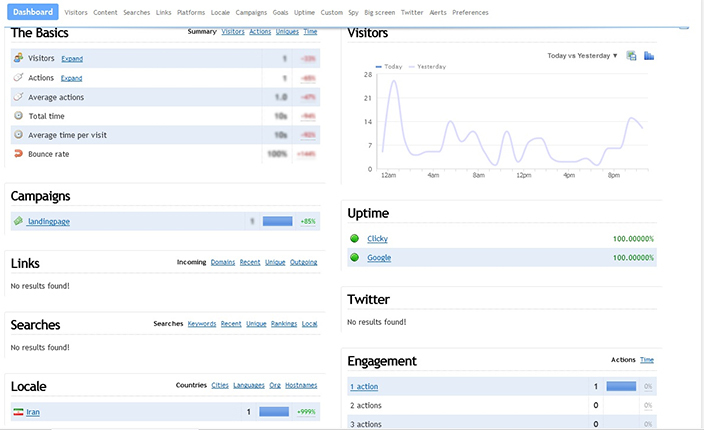 GoSquared has a real-time monitor that allows you to view web visitors on your site in real time along with the sources from which they come to your site. It also enables you to join Twitter conversations instantaneously if there is someone linking to you. The best thing about this tool is its ability to estimate bounce rates more precisely compared to other analytics tools. ClickTale: Data accumulated by ClickTale provides you with useful insights so that you can satisfy your web visitors by creating more value. This analytics tool is ideal for determining user behaviour, their requirements and intent. Along with conventional conversation analytics, this tool generates visual heat maps and reports by making use of meta-statistics. For example, while reading a specific text, web visitors usually keep hovering over the text. The Mouse Move Heat Map of ClickTale presents this statistics to enable you to perceive how different layouts of web pages affect user behaviour. ClickTale basically acts like a video recorder that provides you with visitors’ recorded sessions besides providing comprehensive data about useful user behaviours, scroll reach, attention span, mouse click, and mouse movement. This analytics tool has both free and paid versions. So these are the four analytics tools picked by us for tracking the online behaviour of website visitors. These tools go a long way in helping you understand the online behaviour of your users so that you can optimize your online presence as well as enhance the utility of your online services. Which tool are you using to understand your web analytics? Do share your views with us. Knowing consumer behavior is a win in online marketing and these analytic tools help a lot. Thank for sharing such a valuable information.